In MD Trader most users use the keyboard to enter order quantity amounts in the Order Quantity field. However, you can also use the mouse wheel to change order quantity. The restrictions established by Guardian firstly, and the maximum trade quantity defined on the MD Trading tab secondarily. Orders increase or decreases by a quantity of ten. Click to select the Enable qty change on left/right click in edit fields option. Set the quantity change property. Click in the Order Quantity box. Move the mouse wheel to increase or decrease the order quantity. You can drag-and-drop working orders from one location to another in MD Trader. Right-click and continue holding down any price and working cell information in the Working Quantity column. Warning: Be very careful. A right-click and release deletes the order! Drag and drop the price/quantity to the cell where you want to place the order and release the button. If you have the Delete all when LTQ column clicked property enabled, left or right-click on any grid cell in the Last Traded Quantity column to delete all of your working bids and offers. To delete a single order, click its cell in the Working Quantity column. Click the blue Delete n to delete all workig bids. Click the red Delete n to delete all working offers. Left or right click on any cell in the Working Quantity column. If the working quantity is for 50 orders, for example, in five separate 10-lot orders, all five orders delete. If there is only a single 50-lot order, this single order deletes. You can quickly filter orders displayed in MD Trader by customer or broker. 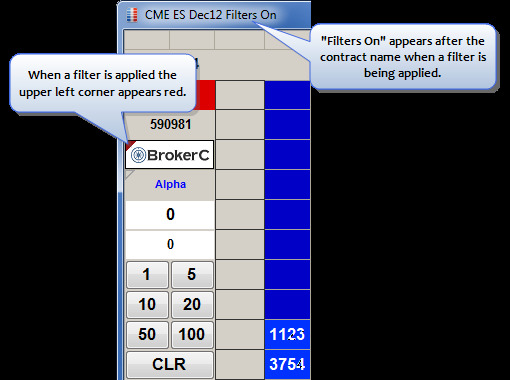 When a filter is applied only orders associated with that broker or customer will display in MD Trader. 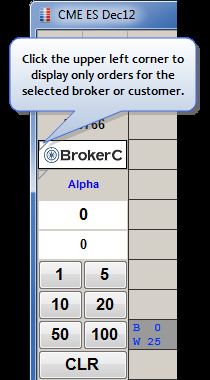 Click the upper left corner of the Broker or Customer. The upper left corner turns red and a "Filters On" appears after the contract name indicating a filter has been applied. Tip: Selecting another broker or customer account while filtering is enabled displays working orders, net position, and average price for that particular broker or customer. To remove the filter click the upper left corner again. If you are sharing an Order Book with other traders, you can filter MD Trader to just show your orders. 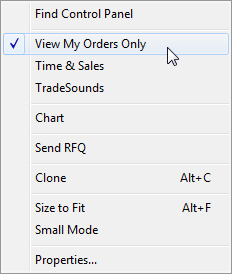 You can do this using the context menu option called View My Orders Only. Once selected, a icon appears above the price column. This indicates you are only seeing your orders in MD Trader. Note: EPIQ is not sent from the exchanges. X_TRADER calculates an EPIQ based on quantity of trades occurring in front of the order, and does not account for cancelled orders nor pro-rata allocations. Click to select the Estimated Position in Queue (EPIQ) property in the Columns section. 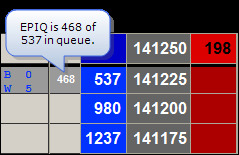 In MD Trader the EPIQ is a set of columns to the left of the buy quantities. To display the EPIQ, click to select the property in the Columns section of the MD Trader Display tab. In MD Trader, the EPIQ number is color-coded to give you even more information about your order. By default your EPIQ number is black. If your order is the inside market, the color turns white. If your order is the first in the queue, the color turns yellow. You can configure EPIQ colors on the MD Color tab. Abbreviations in the working column help you track your working orders. Your order is Working (W) when it has been sent but has not received fill. Your Buy (B) or Sell (S) order has received a fill but may still have a working quantity. An Undisclosed (U) quantity appears when you place an order that has not yet entered the market. A Disclosed (D) quantity appears when you place an order that hides a portion of its overall quantity. When you have a disclosed quantity, the undisclosed abbreviation shows the portion of the order still hidden. If allowed by the exchange, you can enter market orders that rest in the book without matching during an Auction or Pre-Open period. These resting market orders are matched when the market opens using the price calculated by the exchange matching engine. X_TRADER distinguishes these market orders from limit orders. In MD Trader, the total quantity of resting market orders to buy display above the Bid Quantity column and the total quantity of resting market orders to sell below the Ask Quantity column. The Market Window also displays resting market orders during an Auction or Pre-Open period. The Bid Market Quantity (BidMktQty) column displays the total quantity of resting market orders to buy and Ask Market Quantity (AskMktQty) displays the total quantity of resting market orders to sell. These optional columns are off by default, and you can expose these columns from the Show/Hide Columns dialog box.